It does more than just handle transportation. This self-driving car can now do more than just transport packages to customers’ homes — it can actually deliver the goods. 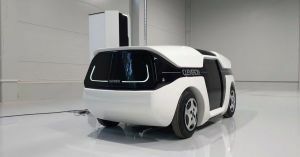 On Friday, Cleveron — the tech firm behind Walmart’s online pickup towers — unveiled a self-driving robotic courier named Lotte at an Estonian robotics conference. Cleveron plans to begin testing Lotte on Estonian streets in 2020. Once the system is in action, CEO Arno Kutt thinks it’ll prove to be a win-win for both retailers and customers. This is far from the first autonomous delivery vehicle we’ve seen, but it is one of the first to completely remove humans from the process — typically, the customer would need to actually retrieve their order from the vehicle. Of course, it’ll be a while before every customer of Walmart and the like has access to a secure parcel locker, but this video is an intriguing vision of the future of retail — and one that might have a decent chance of actually coming true.